How An Edible Battery Could Power Medical Robots You Swallow : All Tech Considered Tiny devices sent into the human body for diagnosing and treating diseases run on batteries that may contain toxic materials. Researchers have come up with a safer battery made of natural pigments. 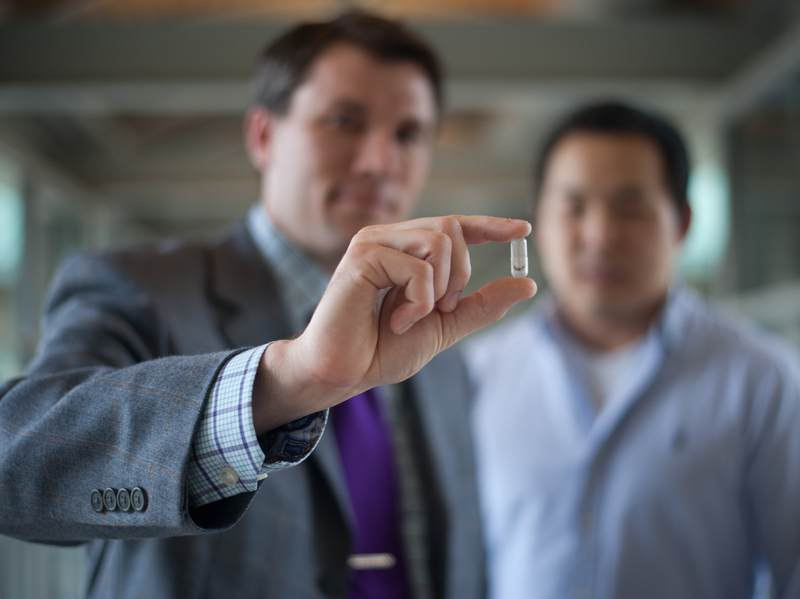 Chris Bettinger (left) holds the edible battery he designed with Young Jo Kim and other researchers at Carnegie Mellon University in Pittsburgh. "I'm not comfortable eating a watch battery." That's how researcher Christopher Bettinger describes one of the biggest obstacles for sending tiny medical robots into the human body for diagnosing and treating diseases. These devices run on batteries (like those in watches) and they are usually made of toxic materials such as lithium. This month, Bettinger, based at Carnegie Mellon University, presented his group's work on creating edible, nontoxic batteries at a national meeting of the American Chemical Society, the world's largest scientific society. The Bettinger group's battery is made of melanin, a dark pigment found in human skin, hair, eyes and the brain. Bettinger says the current prototype lasts "for about 16 hours" and then "degrades to benign components." "I have eaten one of my batteries and I'm still fine — I'd be fine eating my battery every single day of my life!" he says. The battery is made from cuttlefish ink extracts and could be used to power "pacemakers, neurostimulators, devices to deliver drugs at a specific time, ingestible cameras and glucose monitors," Bettinger says. Researchers have experimented with melanin-based electronics since the 1970s, some even winning the Nobel Prize for it. Nevertheless, the discoveries had remained largely forgotten until the late 2000s, when a type of melanin was shown to be an electronic conductor, which sparked the renewed interest. Riding this tide, Bettinger tried his hand at creating semiconductor chips with melanin. "It didn't really work at all, but it turns out that the same property that makes it a terrible transistor makes it a great ingredient for a battery," he says. By 2013, Bettinger had his first prototype of a melanin-based battery, with a lifetime of five hours. Three years of subsequent research tripled the battery life and resulted in "preliminary [partnership] discussions with a few people — mainly big pharma," he says. Making batteries with melanin "is a very, very interesting and powerful idea," says Phillip Messersmith, a professor of material sciences at UC Berkeley. "Biological inspirations are really powerful in the context of sustainable energy storage and sustainable materials," he says. Gregory Payne, a professor of bioengineering at the University of Maryland, says "it's pretty important research." Bettinger says the melanin battery research is "still in the preliminary stage." While the team "anticipates very little toxicity response" to the melanin battery, he says, no clinical trials have been carried out to prove its safety. The current battery prototype contains a small amount of Teflon as a binder, which is not biodegradable. Clara Santato, a professor of engineering physics at École Polytechnique de Montréal, says research to create melanin-based power sources without binders is underway. Even then, safety questions linger. "I don't know that there is consensus on the toxicity of melanin," Messersmith says. "It's an open question ... [although] I do not foresee significant problems in the GI tract applications." Payne says, "What is mystifying to me is that melanin is a relatively abundant material in your body but there's very little understanding of what function it performs." Melanin comes in many different forms, and some aren't as good for the purpose of making edible batteries. "One of the concerns about melanin in the brain is that it doesn't degrade rapidly," Payne says. So far, it's unclear if a melanin-based battery is completely safe because nobody really knows what melanin is. "[Chemists] are still debating it. ... it's not that easy to figure out the structure," Payne says. Scientists say there's no guarantee that the lab results can be replicated for mass production since so little is known about melanin. "It can for sure be improved," Santato says. "It's really now the engineering of the molecules." A previous version of this post said that professor Clara Santato referred to Teflon as an expensive, toxic and dangerous to humans and the environment and that research to create a Teflon-free melanin battery is underway. Santato was referring to a different material that is not used in the Bettinger group's battery. In fact, Teflon is a nonbiodegradable material used as a binder in Bettinger's prototype, and Santato says research to create melanin-based power sources without binders is underway.